Take a journey on Illinois Route 4 ( old Route 66 ) past Chatham and look for Cherry Grove School on your left. You’ll find it almost instantly after you cross a small bridge. 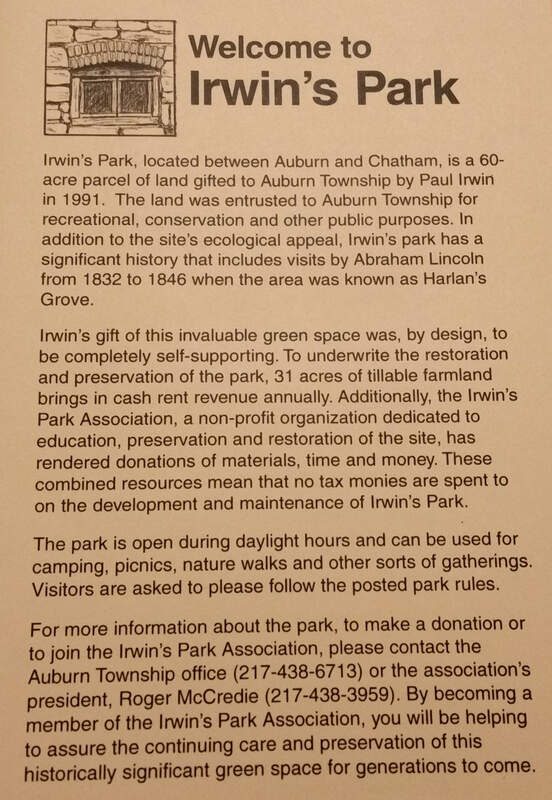 Drive down the road next to school house and you will find Irwin’s Park ( Harlan’s Grove ) on same side as school. If driving from Auburn Illinois turn will be on your right. Years ago there was no signage on Route 4 for park – now there is. Unfortunately most of my online Irwin’s Park photos got scrambled a couple of server moves ago. Many years have past and I have yet to retrieve those pictures and get them live on this site again. 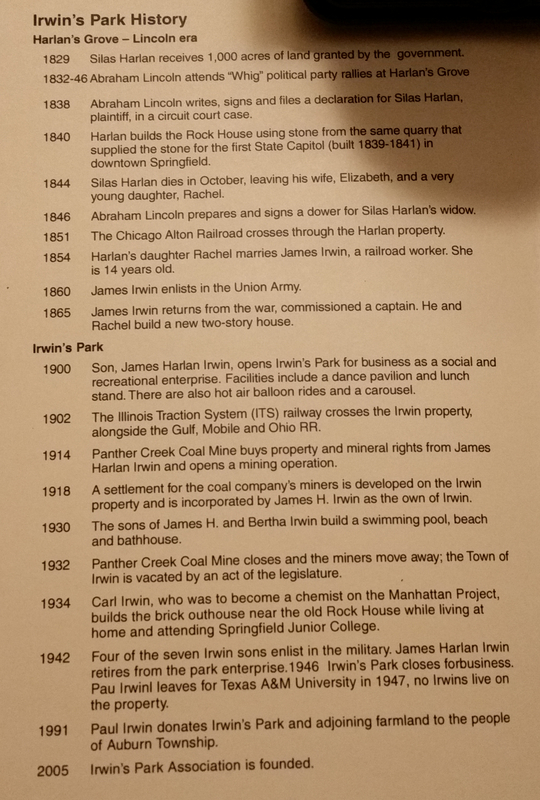 There have been some negative and positive changes at Irwin’s Park. A large pavilion was built on other side of railroad tracks. Parking lot entrance to park had trees removed ( an older lady use to take care of plants by these trees ) – the once nice entrance is anything but now. Safety fencing has been put in place with Illinois higher speed rail upgrades. A Lincoln era home near outhouse has been demolished – along with at least one other historical building. Irwin’s Park entrance and surrounding area no longer looks like this This does show where trees used to be. Picture shows parking area for park – trees used to be in middle of lot. Photo used on map is very outdated. Tracks that have wood ties in photo – have all been torn out – replaced with new rail and concrete ties ( you can see part of that process here ). Fencing is now installed to protect humans and creatures hopefully from being killed or injured by fast moving trains.